For Russian youngsters these days, Stalin is a figure from the distant past. His appearance in this kind of setting doesn’t shock anyone. The hipster precincts of Moscow these days have plenty in common with their Brooklyn cousins, Williamsburg and Bushwick: an all-too-familiar ecosystem based on coffee bars, techno clubs, bike repair shops and ample facial hair. So young visitors to one trendy barbershop perhaps can be forgiven for not recognizing the handsome, young bearded man with a fashionable black-and-white scarf depicted in a mural on one wall: Josef Stalin. 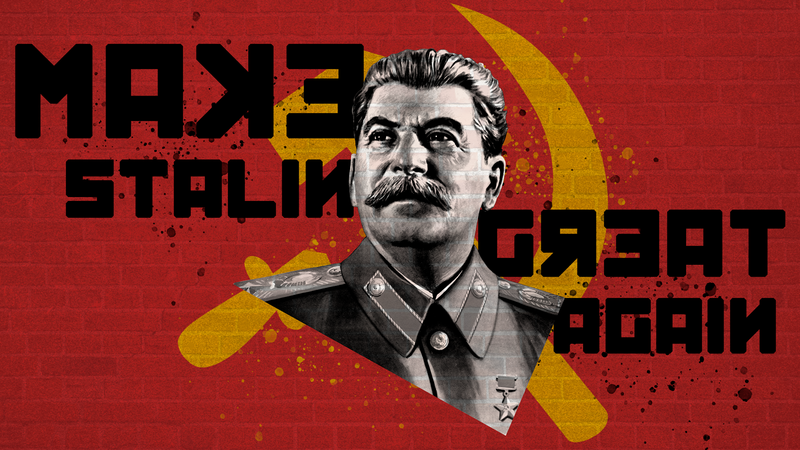 For Russian youngsters these days, Stalin is a figure from the distant past. His appearance in this kind of setting doesn’t shock anyone. Nor do many young people see this marketing trick as an insult to the memory of the millions of innocent people repressed, imprisoned and killed during Stalin’s long tenure as dictator of the Soviet Union. That represents a small victory for Russian President Vladimir Putin and his political allies who are waging another one of the wars that have raged periodically in Russia for decades. Opposing them is what remains of Russian civil society, which seeks to preserve the memory of victims of repression as a way of fighting today’s authoritarian political regime. Just as a photo of the mural was making the rounds on social media, the Moscow mayor’s office banned this year’s installment of “Returning the Names,” an event with extraordinary emotional power in which people line up opposite the headquarters of the KGB (now FSB) to read aloud the names of those who were shot or who perished in the Gulag. In the end, the mayor’s office gave in, which perhaps helps explain why even more people than usual stood in the bitter cold for four hours to take their turn. One of the paradoxes of Putin’s Russia is that the harsher the stance of the current regime, the higher the level of Stalin’s popularity within Putin’s electoral base and the more likely these Russians are to make excuses for the Soviet dictator. This pattern became more noticeable following Russia’s annexation of Crimea in March 2014. According to data from the Levada Center, an independent pollster, 17 to 20 percent of respondents in 2014 had a negative view of Stalin. This figure dipped to 12 percent in 2018. Meanwhile, acceptance of the view that Stalin is guilty of killing millions of innocent people dropped from 62 percent in 2016 to 44 percent in 2018. The percentage of respondents who declined to answer that question also increased significantly, from 16 percent to 29 percent. These changes reveal only one attitude to be stable: Recognition of Stalin’s role in the Soviet Union’s victory in World War II barely budged during this period. Increasingly, this war over memory is spilling over into a war over monuments. A new wave of “people’s initiatives” to commemorate Stalin has appeared in recent years. In the latest incident, a public hearing was held in Novosibirsk, Russia’s third-biggest city, over whether to put up a bust of Stalin in the city. Imagine a similar debate somewhere in Stuttgart on whether to erect a bust of Hitler. Russian civil society is still capable of exchanging blows with the Stalinists. At the Kommunarka former NKVD shooting range on the outskirts of Moscow, where 6,609 people were shot, a Wall of Remembrance listing the names of the victims was opened on Oct. 27 last year. Completion of the memorial was complicated by a debate on whether to include the names of executioners, who were themselves later repressed. Still, this is another important step in memorializing victims of the regime. Another battle is being waged over a building on Moscow’s historic Nikolskaya Street, just a few hundred meters from the Kremlin. People were shot en masse in the basement of the building when it housed the dreaded military division of the Supreme Court. Now the owner of the building intends to open an upscale perfume store over the bones of those slaughtered there. Memorial finds itself not only doing combat with the state but also with the avant-garde of Russia’s glamorous consumer culture, who see nothing terrible in Stalin, and whose historical memory has been wiped out entirely. It’s worth remembering that civil society in the Soviet Union was itself born from anti-Stalinism, and it continues to develop in modern Russia on precisely the same grounds. Another ambitious project, titled “the Last Address,” encourages people to remember Stalin’s victims by erecting memorial plaques on apartment buildings to which arrested victims never returned. The project reveals not only the scale of Stalin’s crimes but also the scale of resistance to the new Stalinists in today’s Russia. And this is one more flank of the history war: Recently in St. Petersburg, local authorities supported a denunciation. It had been stated that the Last Address violates … the law on advertisements. I myself put up a plaque on a building right in the center of Moscow from which my grandfather was taken away; he died in the Gulag in 1946. In the building where he and our family lived until 1965 — one Moscow building alone — six people were arrested during the Great Terror. The plaque is my personal victory in my personal war of memory with the Stalinists. In 1987, at the height of Gorbachev’s perestroika, the rock musician Boris Grebenshchikov recorded the song “This Train Is on Fire,” which includes the line “The people who shot our fathers are now making plans for our children.” Back then, more than 30 years ago, a return to Stalinism seemed unthinkable.